This one is a no brainer. I have a few videos that I just love to watch, so here is a selection. Some I made, some from others. The very first example of Lipdub I saw online (Flagpole Sitta by Harvey Danger). It is just so well done. I really like the song, and the singer – my friend Mshel. Who knew she could sing and play the ukulele! My most visited website: Facebook. Hands down. Can’t stay away. Sometimes amuses me, sometimes like a train wreck that I can’t look away from, always a useful distraction. My favourite website design: I like the way my friend Mshel‘s blog page looks. Sometimes I go there just to look at the pretty pattern and the groovy banner pic. That’s not creepy is it? My favourite website for interesting content: PostSecret, weird and interesting. Sometimes it brings tears to my eyes. My most useful website: has to be Wikipedia. I visit this site every time I want to know anything about anything. The 17 Laws of Futsal? Wikipedia will tell you! All the movies Jason Isaacs has ever appears in? Wikipedia! Hurrah for Wikipedia for making me look smarter than I am. My favourite new discovery: RunKeeper. How awesome is this! It tracks all my runs, I can see how far and fast I’m going, it tells me how many calories I burned AND it’s an iPhone app. Very cool. Honourable mention: Twitter. It’s just there, twittering away. Always on, always interesting. I’m not sure I can claim any special talents. I asked Stephen what he thought my main talent is…but I won’t repeat his answer. I’m good at a lot of things, but I wouldn’t call them talents. I’m great at organising people and things, I’m a pretty good writer, I’m good at being friendly and outgoing, I pick new things up fairly quickly. But I don’t think these things are all that special. I felt sick before my first full game tonight. It’s really hard to try something completely new, be really bad at it, and keep coming back for more. But this week I was a little better than last week, and next week I’ll be a bit better again. In my life so far, I have always tried to put my all into anything I try, and I usually find that I can do well at it. It’s an unfamiliar feeling to be an absolute beginner and have no clue what I’m doing. But I am determined to get better! And I feel so lucky that I have a really supportive team, and an awesome boyfriend who tells me I’m doing great and that he’s proud of me. I’m having so much fun and he’s right there beside me cheering me on. It’s such a good feeling. 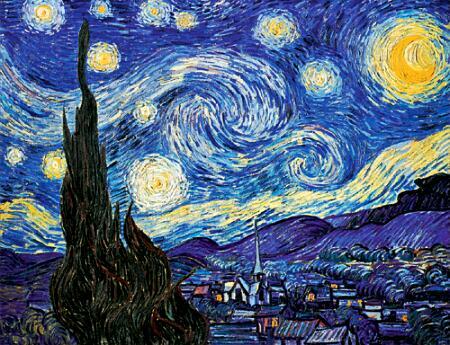 I think my favourite painter is Vincent Van Gogh, and my favourite painting by Van Gogh is definitely Starry Night. I just love the colours and the form of this painting. Hmm, fan fiction. I can honestly say I have never read or written any fanfic. I am simply not that kind of geek. For those of you who don’t know, a fanfic is a story written by a fan of a book, movie or TV show. The fan-writer takes the characters and plot of the original book or show, and develops them in new and interesting ways. When I think of fanfic, I think of Star Trek. 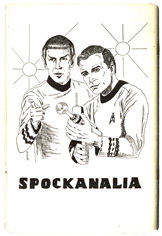 According to Wikipedia, Spockanalia was the first modern example of a fanfic. It was a fanzine (magazine written by fans) published from1967-69 and had four issues. I can only image what it contained…Star Trek fans can be a *little* strange. I have to make the sad confession that I have read some of William Shatner’s TekWar series. Not exactly fanfic, but as geeky as I get. I vaguely recall that they were interesting enough, although not especially well written. I sometimes wonder what Star Trek actors and writers must think of the fans. I suspect that William Shatner, who played Captain James T. Kirk in the original Star Trek, quite enjoys the attention. Other than writing sci-fi novels, he attends Star Trek conventions and was involved in a documentary about the TV series. It seems to me that Star Trek is a universe of it’s own, complete with action figures, collectable trading cards, comics and fanfic. And there we go, I made it back round to the topic in the end! 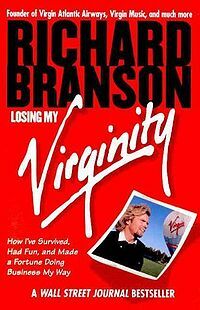 I just finished a book that I’ve been trying to read for years – Richard Branson’s Losing My Virginity. Because I’ve been really struggling to read any book in the past couple of years, I got this one as an audiobook from Audible. I listened to Richard recount his life as a successful entrepreneur on my morning runs – it was a very enjoyable way to spend some quality time, just me and Richard and the cold hard road. Like I’ve said before, I really love listening to audiobooks, and Audible is a quick, cheap and convenient way for both Stephen and I to enjoy books we would otherwise not get a chance to read. We have a subscription that gives us one audiobook of our choosing each month, and I find that’s about the right amount of time to get through a medium-sized book. We’ve even built book-listening into our weekly routine. ‘Date-Sunday’ consists of us going to our coffee place (chosen because it has comfy sofas and good cake) and listening to whatever we’ve each downloaded that month. It’s great together/apart time, and is a precious part of my week.